Last year, Rockflower supported RAIN in their goal of achieving two of our five keys, Access to Food and Water and Economic Empowerment. 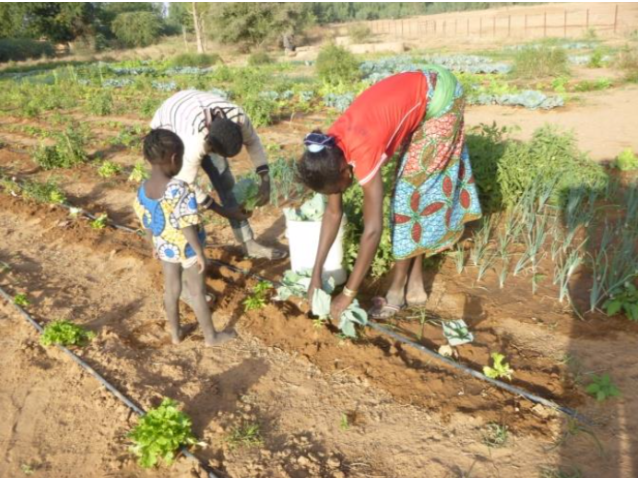 The Sustainable Agriculture programming in Nassilé and Tagantassou was strengthened due to our support, particularly as the need for such a program has increased due to a difficult agricultural year in western Africa. Nassilé began the next growing season in September by meeting to assess their past revenue and decide on a timeline of implementation. In addition to meeting, they received practical training to enhance their gardening and increase their knowledge of market economics. The garden was started by choosing a high ground settlement to avoid flooding during the heavy seasonal rains. Then the land was cleared so that it could be plowed and levelled. Irrigation was installed resulting in 72 garden beds. October saw the first transplanting of tomato, eggplant and yalo crops. In addition to these crops, the nursery beds also have lettuce, green pepper, cabbage, carrot and onion. Tagantassou had their first meeting to discuss preparations and the successes they had last year. The women were satisfied with last year’s production, but were constrained due to a lack of well water and caterpillars invading the tomato crop. They plan to utilize a biological treatment to limit or, hopefully, stop the damage. Their second meeting included practical training and a site location for the garden. In October, 18 beds were established with onions, green pepper, lettuce, tomato, cabbage and eggplant. Last year, 35 women gardeners from Tagantassou cultivated 1945 m2 of land to harvest 1034Kg of crops which supported over 1,000 Nigerians in the surrounding communities. In both Tagantassou and Nassilé, the knowledge they have gained through practical training has resulted in food security and built livelihoods. For example, in Nassilé total earned income was 198,352 FCFA (~US$345), which is significant as Nigeria’s GDP per capita is approximately US$378. Due to the women gardeners satisfaction with last year’s production and their enthusiasm for this year’s crop yield, they are looking forward to the next phase of expansion. Two new wells will be dug in spring, one in each community, to increase access to water and enable a significant garden expansion. The expansion of this program will allow more community members to participate and for more of their, and their neighbors’, food security needs to be met.